Hey everyone! 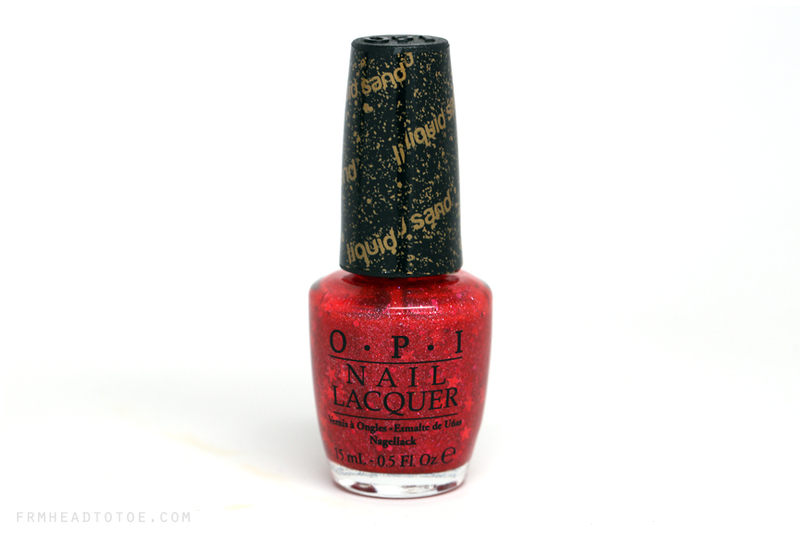 Today I wanted to share with you another polish from OPI's Liquid Sand collection. 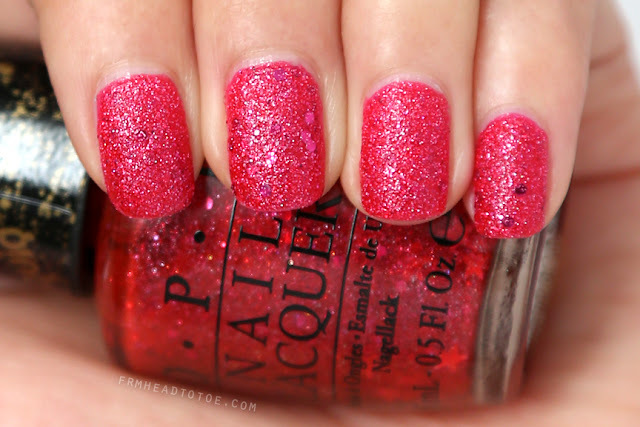 After being stunned by the beautiful blue "Get Your Number" from this line, I eagerly snatched up "The Impossible" which is a hot red-pink textured polish with red, silver, and holographic glitter particles as well as the occasional red star glitter. Did I love it as much as my first experience? Let's take a look! The Impossible comes in the same "liquid sand"-capped OPI bottle except you immediately notice the star particles floating in the base. By first impression, the polish looks like it will be very RED. On the nails it doesn't actually become red until 3+ coats (should you need that many) and instead takes a more saturated, reddened hot pink appearance which is quite wearable on my skintone. The color itself is actually more muted than I thought it would be since the blue was so intense in comparison! Still very pretty though, with it being much more glittery in real life than on camera. Here is a close-up in direct sunlight which I wanted to share to really show off the texture of the polish. If you can imagine the majority of those "sandy" pieces being reflective glitter particles, you will get a better idea of how this polish actually looks. I used 3 coats over CND Stickey Base with no top coat. The biggest difference between 2 and 3 coats is that with 2 the polish looks very much hot pink while 3 made it more red. Next time I'll probably stick with 2 coats! Although there are a few holographic (rainbow) glitter pieces seen in sunlight, most of the time the red color of the base shade really blended them in, so overall the glitter appears just hot pink. Sadly, the star glitters needed to be hand-placed to even make it to the nail from the bottle and they snagged on clothing and sheets. Overall I do enjoy the look of this polish and LOVE how intensely sparkly it is, but because the red color doesn't allow it to shine as rainbowy and intensely contrasted as the blue version, I shock even myself by saying I like the blue version better! Still, the wear is fantastic (virtually no chips for days for both with no top coat) and for anyone who hasn't tried the Liquid Sand polishes I recommend you try at least one even if you were a skeptic like I was. 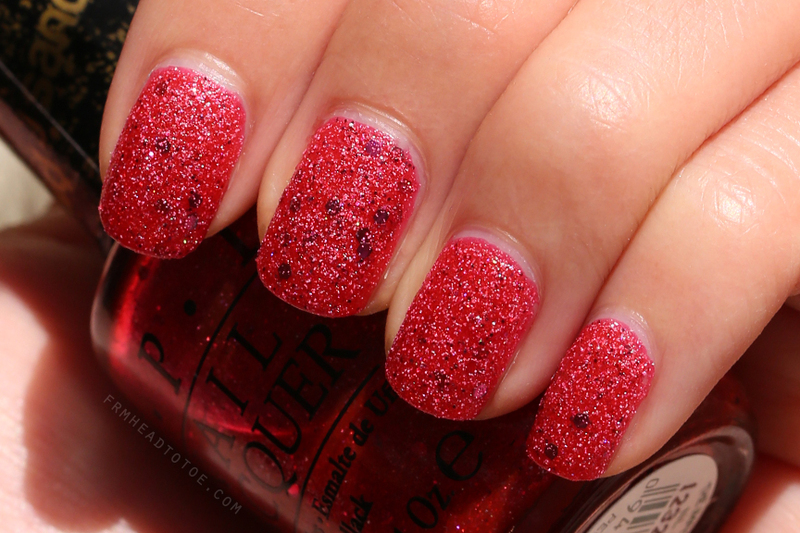 Readers, have you tried any Liquid Sand polishes? Do you usually wear conservative or dramatic colors? Let me know in the comments! I just did mine in Silver Sand which is by China Glaze and similar to the OPI collection, your's is very pretty so maybe i'll have to try them. Visit and follow my Blog at http://lilyseymour.blogspot.com. I saw Zoya had a similar collection called Fairy Dust as well! Looks like all the major companies are in on the textured glitter polish game. I have been enjoying the Liquid Sand polishes - the black one is definitely my favorite. I'll have to try that one soon! I love this nail look.. and I love your blog/videos. I have been following for many months now!!! There's a black on with red glitters in it! It's called "Stay The Night". Can anyone tell me where i can get this nail polish? Thanks! and I love you videos! i also make videos on youtube! check me out! Is it hard to remove it? It's about the same as any glitter nail polish. Not too fun but not impossible! I got this because I loved how it looks on your nails! True enough it looks good on my nails as well. Thanks for the review!